As it is a Sunday, the Fiery One and I had what has become a traditional brunch with a group of friends. Normally this group includes us along with Tahini Monkey, Politiko, Friday, and sometimes P, with the occasional peppering of other friends and family. This morning we were a smaller group than normal, as it was only the Fiery One, Tahini Monkey, Politiko, and I, but we enjoyed it nonetheless. It is odd how attached people can become to rituals, even if they are relatively new and arbitrary and begun with relative strangers. The word "brunch" has gained a much more specific meaning for me over the last weeks: it connotes Sunday and a particular collective of individuals and buffet and hashbrowns and the possibility of coffee at Deep Space Nine. It is becoming an institution in a way. For example, when the Fiery One and I had to miss it one weekend, we were made to give a reason, and only when we said that were going to be out of town was our absence deemed acceptable. We should have bowling shirts or matching letters on our jackets or identifying tattoos in our ears. After brunch, Politiko left early and the rest of us decided to meet up at Deep Space Nine for coffee. I, having not seriously tried to draw anything freehand in at least five years and very likely more, packed up white paper and a black pen. My mission: to draw my comrades in brunch. I'm not sure why I was struck with this urge, because I have never been able to draw well at all. I have been feeling the great creative flow lately and have been frustrated by my lack of skill in a few artistic areas. I want to paint and draw, but I lack the experience to feel that I even know how to start a project. The greater portion of my life has seen me filled with creative self-doubt, and I have allowed this to stop me from even trying some very basic endeavours, such as drawing. Something about brunch today fortified me, and I thought to myself Self, screw your fear of creating aesthetically unpopular art! You are going to draw! In public! And let other people look at it! 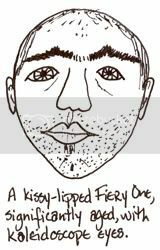 This one of the Fiery One was actually the second drawing I did at Deep Space Nine. He thinks he looks like a thug in it, which is not at all how he appears in real life. In real life, his eyes are not nearly so close to the top of his head. 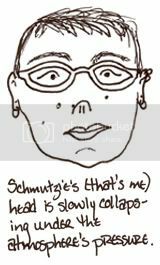 In actuality, his head is built like a townhouse: it is long and extends back a ways, giving the impression that it is not as large as it really is. This is me, of course. It is very difficult to draw oneself, but at this point I had already done two drawings and felt a little more confident. 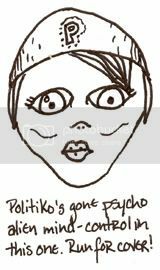 This one was a lot harder to draw, because by the time we got to Deep Space Nine, Politiko had already left for some very important thing. Since she wasn't around to study, I went from memory, which really didn't make that much of a difference now that I look at it. I mean, I had the Fiery One right in front of me, and you can see how that turned out. 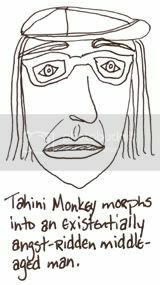 Tahini Monkey's portrait was obviously the first. She looks absofuckingentirely nothing like this picture, I assure you. Despite its complete lack of basis in actuality, I like it, though. Sometimes unintended results can be more fun and more informative than the results of a task completed as planned. This unintended result taught me that I need to keep drawing. Now this one, my god, I don't know, I just don't know. Friday wasn't at either brunch or the coffee afterward, so with little to go on but a lot of caffeine and an exceedingly low level of acquired skill, I executed this little demon doll variation on the Friday theme. 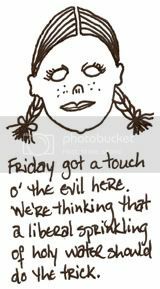 Many apologies, Friday. No insult is intended with this rendering.